The owners wanted a kid-friendly scheme that works with their eclectic tastes and their home’s turn-of-the-century architecture. And they weren’t afraid of bold color. A seascape by New England artist Sue Charles from Powers Gallery in Acton lends softness to the sitting room. Over the fireplace, Cupcake sconces by Dunes and Duchess cast a glow. 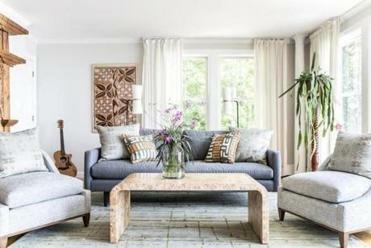 The new owners of a Victorian house in Melrose were certain of what they liked, but they didn’t have the time — or, admittedly, the skill — to put it together. They hired Barbara Elza Hirsch of Elza B. Design in Concord, who started sleuthing. A professional couple with two small children, the clients “wanted a colorful, kid-friendly scheme that melded their modern and eclectic tastes with the turn-of-the-century architecture,” Hirsch recalls. The breakthrough came from their client questionnaire and the artwork they already owned, which included a glossy, polychromatic piece by Lisa Bartleson — now in the dining room — that the husband had bought years earlier in New York. 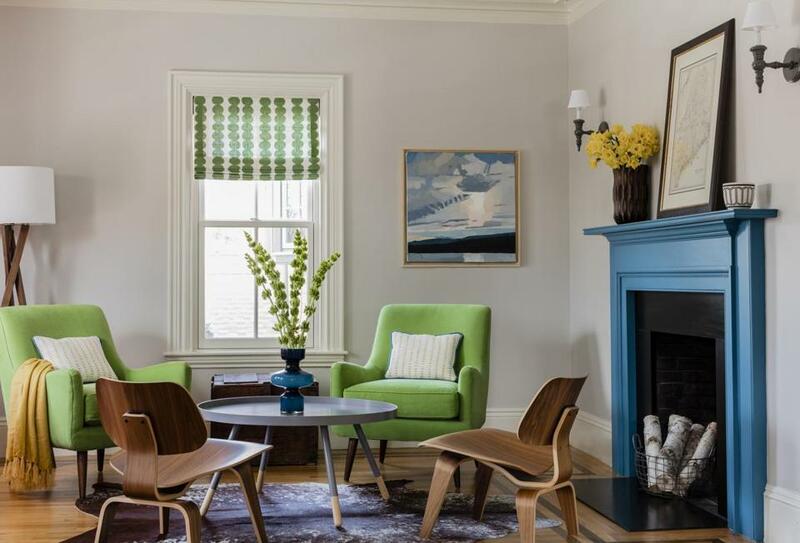 “The art was a big hint that they were not afraid of color,” says Hirsch, who established a palette of bright blue, green, and yellow suitable for an energetic young family. 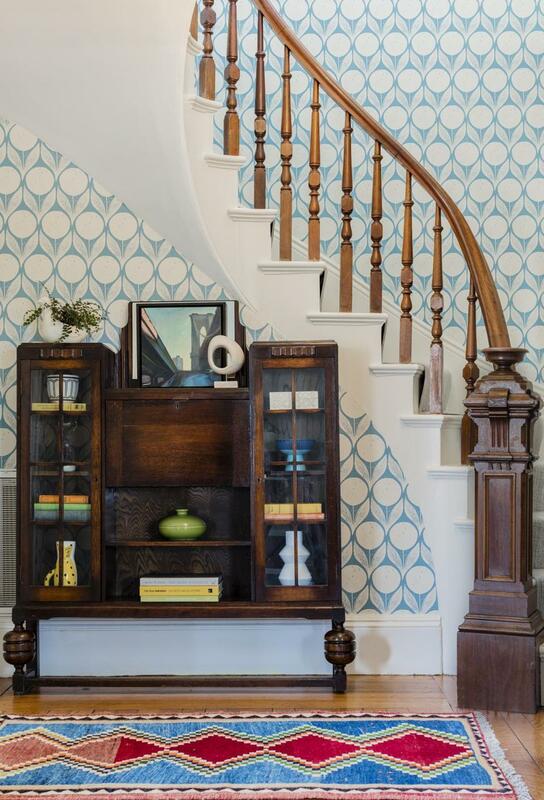 In the entry, she switched out the wallpaper, replacing a frumpy floral with a stylized floral pattern inspired by a 1950s Scandinavian block print. A funky vintage cabinet the wife bought early in her career picks up on the millwork of the staircase and anchors the space. “It was a dumping ground for everyday things, but we turned it into a statement piece with antique books, glassware, and boxes,” Hirsch says. The perfect family gathering place, a reclaimed-wood farmhouse table, was already in the dining room. “I told them right from the start there was no need to get a new one,” Hirsch says. The couple had commissioned the table when they first married, hoping that someday there would be kids doing crafts on it. The Dash & Albert indoor-outdoor rug is worry-free, and the George Nelson pendant light adds softness and structure without distraction. Hirsch spruced up a barely used window seat, now known as the “cuddle corner,” transforming it into the most coveted spot in the house. To accommodate the reality of life with small children (toys! ), the desire for a place to chill, and aspirations for entertaining, Hirsch divided the long, narrow living space into three zones. At the front of the house, a sectional, upholstered in easy-care fabric, hugs a corner of the room atop a soft wool rug. A round felt ottoman makes for a child-friendly coffee table, and the arc floor lamp is tucked safely behind the sofa. Roman shades in Schumacher Full Circle, a playful pattern featuring green polka dots with a Marimekko vibe, carry through the space. Asian, African, and Middle Eastern styles enliven a home overlooking Casco Bay. In the middle, Hirsch carved out a dedicated play area lined with cubbies. Beyond, the fireplace mantel, painted Sherwin-Williams Amalfi blue, draws the eye to the back of the house. Hirsch created a seating area conducive to adult conversation, with bright green upholstered armchairs and Eames molded plywood lounge chairs. “The circular layout also counterbalances the room’s long shape,” Hirsch says. In the dining room, Hirsch dressed the window seat — a.k.a. the “cuddle corner” — with a cushion covered in Sunbrella fabric, Roman shades in an organic leaf design, and throw pillows in colors pulled from the living room. In the entry, a vintage 1950s Persian geometric rug from First Rugs in Acton adds color and introduces new shapes. “It’s not too matchy-matchy,” says designer Barbara Elza Hirsch. In the sunroom-turned-office (below), which is visible from the dining room, the teal-and-yellow color scheme carries through. 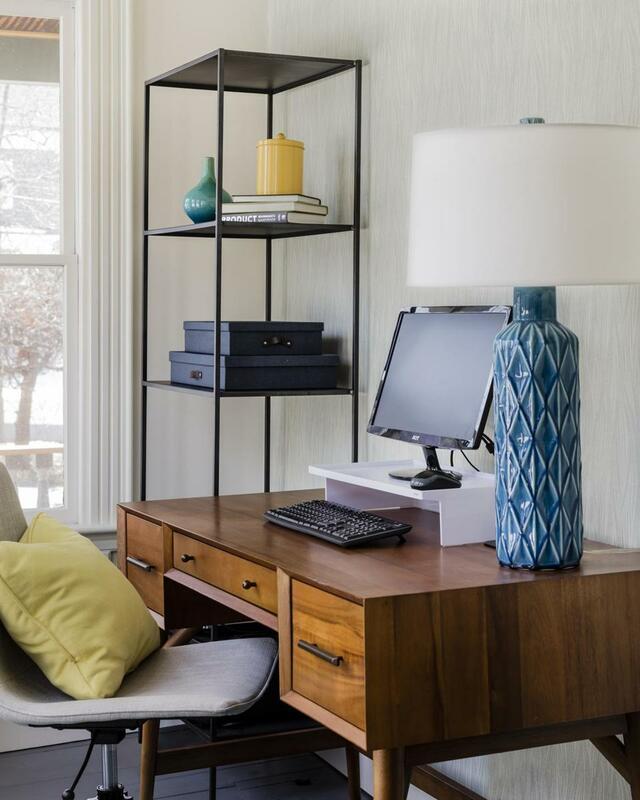 The desk is from West Elm, and the lamp is by Arteriors Home. Marni Elyse Katz is a frequent contributor to the Globe Magazine. Send comments to magazine@globe.com. Get the best of the magazine’s award-winning stories and features right in your e-mail inbox every Sunday. Sign up here.